How does the La Folia sound like? There are three types of files to be downloaded. The first type is a MP3-file reproducing the sound of 'acoustic' instruments in a compressed file, which takes less bytes than a wav-file (one of the standards for storing acoustical data), but you need a mp3-player as a plug-in. The second type is a link to Folias at the YouTube website. The music is featured with (moving) images in mpg or flv files. The third type is a midi-file, which is very easy and fast to download (less than 10 seconds). However you are not listening to 'authentic' music as produced by acoustic instruments. It is created with the computer as intermediary and the quality of the sound depends on the quality of your soundcard. Apart from these files it is possible to listen to original fragments of real-time music at some internet recordshops (Cd-Now, and CD-Universe) or sites specialized in moving pictures as YouTube. 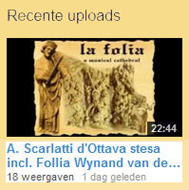 A simple search on the word 'Folia'(or 'Follia', Folies d'Espagne or Folias) in the classical genre will result in some nice acoustic examples to listen to. In the past all mp3-files were listed here. However the number of files kept on growing apart from the increasing file sizes. Since March 2008 it often happened that at the end of the month the site ran out of bandwidth and was closed down by the provider till the first date of the next month. To avoid accommodating visitors only interested in downloading mp3-files without any interest for the folia theme itself, I have given up listing all mp3-files since June 2008 here. Downloading Mp3-files takes a lot of bandwidth compared to midi-files. A growing number of mp3-files (mostly fragments) is added at the website but only indicated at the relevant composer section. Remember that the only purpose is to give a brief impression of what this folia-music is all about and to illustrate the intentions of the composer/performer. To appreciate the richness of the music and its interpretation it is best to visit a library, conservatory or recordshop. The website of YouTube (http://www.youtube.com/) is a channel for musicians to broadcast their own performances. It is not always that easy to distinguish between exposure and propaganda of musicians themselves or commercial recordings that are exposed there without the consent of the record company or the musicians themselves. It should be pointed out that there is no intention to bring the music alive in these examples because these midi files used as examples lack any kind of expression and dynamics. The only purpose is to give a brief impression of what this folia-music is all about. To appreciate the richness of the music and its interpretation it is best to go to a library, conservatory or recordshop. Alkan, Charles Valentin Complete andantino 4'50"
Ponce, Manuel Theme, variations and fugue 25'46"
La Follia Variations for Recorder Quartet (1996): M.J. Starke. Duration of the music 3'14" and the size of the file is 9kB. The arrangement (set of 5 variations) is based upon the Corelli variations for alto recorder and continuo. © 1996 and used with permission. Duration of the music 3'25" and the size of the file is 18kB. This set of variations, probably the latest sequenced in the 20th century, is grouped into repeating blocks of 16 bars for 'piano' starts with a parallel descending melody line before in the third variation a syncopated counter melody is introduced to give the piece a ragtime feeling. The last two blocks are a further exploration of the syncopation within a 'classical' atmosphere. © 2000 and used with permission. La Follia da Spagna con molti variazioni per il Clavicembalo in parte due a quattro: Mark Moya based upon the folia-theme utilised by G. Pacchioni. Duration of the music 7'00" and the size of the file is 25kB. © 1997 and used with permission. Fandango-prey: 'composed' and transcribed by Paul Gabler. Duration of the music 1'19" and the size of the file is 6 kb. Inspired by the fandangos of Soler and Boccherini the vast intro looks promising but after the first three chords of the theme the fandango got carried away by the Folia. In the solo-part there is a moment of consiousness followed by an attempt to restore the fandango for a brief moment till it's evident that the folia will not let go and the music gives in abruptly. © 1998 and used with permission.